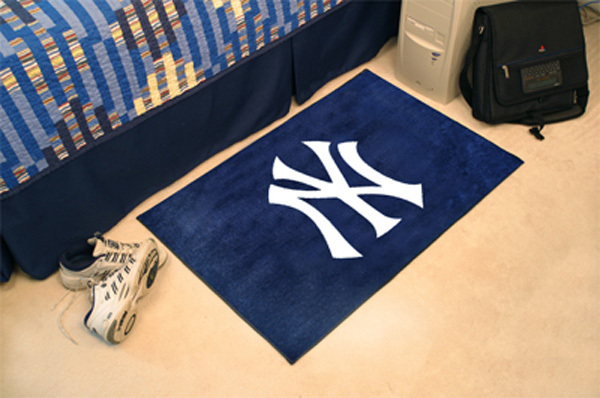 Decorate your home or office with New York Yankees area rugs by FANMATS. Made in U.S.A. 100% nylon carpet and non-skid Duragon latex backing. Officially licensed and chromojet painted in true team colors. All products on this website are CUSTOM MADE FOR YOU as they are ordered. Orders placed today are estimated to ship on May 9th. Faster completion & shipping MAY be available on SELECTED products at the rate of 25% of the total item cost. For more information please call (888) 501-5510. Logo Location The crosshairs denote the logo position.